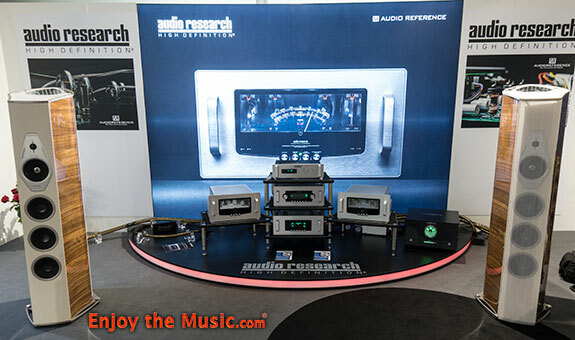 World Of McIntosh's Audio Research teamed up with sister company Sonus Faber to deliver a one-two punch of audiophile sound quality here at HIGH END 2018 in Munich. As you can see, the entire front-end is filled with some of the very best gear offered by Audio Research and the sound was quite good considering the less than ideal setup and room location. One of the truly cool things are the 'ghost meters' on the front faceplate. It was quite a challenge to photograph them in action, yet they are truly tremendous to look at! Excellent quality products that are perfectly suited to the millionaire and billionaire within all of us. 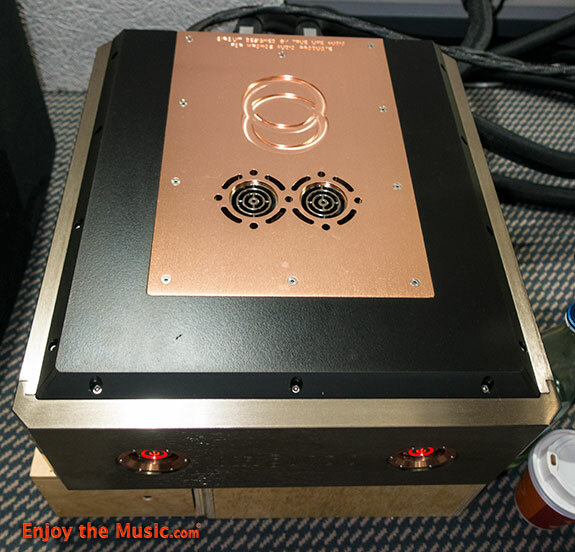 See Enjoy the Music.com's review of the Audio Research vacuum tube LS28 line stage & VT80 power amplifier at this link, plus we have a world premiere review of the Sonus Faber Amati Tradition floorstanding loudspeaker at this link. 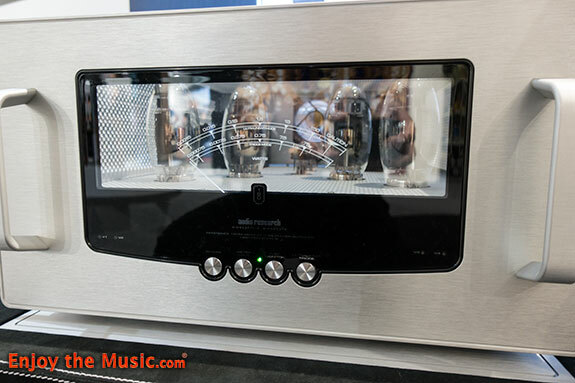 Fonica International was at HIGH END 2018 showcasing their unique new prototype flagship (€40,000) and their Flag M IW in-wall speakers (€8100 per pair). Featuring isodynamic speaker technology, musical sounds emanate from a large surface area consisting of a thin, ultra-light membrane. This membrane moves evenly along the entire surface to produce sound. By reacting to the impulse of a magnetic field, this membrane vibrates producing virtually pure sound. Each speaker produced by Fonica International is meticulously hand assembly by expert specialists experienced in speaker manufacturing and assembly techniques. Their planar dipole design provides an immersive, room-filling audio by creating symmetrical sound from both the front and back of the speaker. 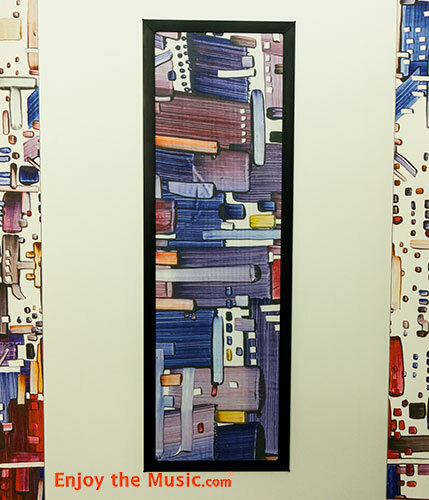 Seen below is their custom in-wall speaker where you can personally choose any solid color or artwork that best suits your home decor. 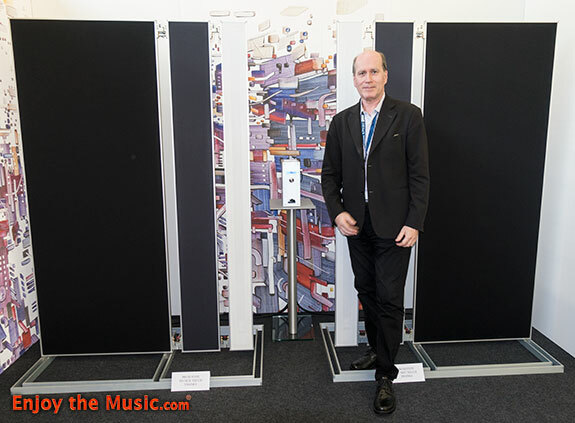 Kronos was at HIGH END 2018 with their top-line Reference Phono stage (€45,000) that features ultra-high quality parts, design, and an outboard power supply. This new phono stage can easily handle both moving magnetic (MM) and moving coil (MC) phono cartridges. There are special adjustments available to ensure the phono stage electronics are perfectly electrically matched to the cartridge specifications. An outboard power supply ensures the critical analog signal path is not negatively affected by the power supply (seen below). You can read Enjoy the Music.com's world premiere review of the Kronos Sparta 0.5 turntable and upgrade to full Sparta at this link. 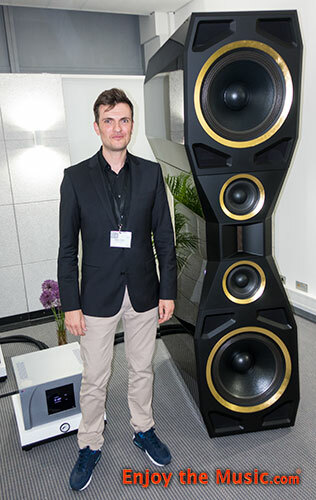 Göbel High End's new Divin Majestic reference floorstanding speaker (€450,000) looked incredible at HIGH END 2018 in Munich! This model sets new standards for the company as their ultimate benchmark for high efficiency and high power handling. Their bending wave technology is based on the principals of sound creation through musical instruments and is the element at the heart of each Göbel High End loudspeaker system. According to the company, "You will experience a soundstage with ultra-high resolution and speed completely seamless over the entire frequency range that you never heard before. Fine details and textures are reproduced unbelievable naturally without any losses and with the highest possible dynamics." Their special loudspeaker design seeks to have your fave tunes 'entirely detach' from the loudspeaker as the walls of the room completely disappear. Instead, you hear yourself within the middle of a real emotional musical event. ---> Onward to Part 12 of our HIGH END 2018 show report.